An Irish American chef will be responsible for feeding some 30,000 Democrats. It’s a big year for Boston. For the first time in U.S. history, the city will be hosting a presidential convention. From July 26-29 at Boston’s state-of-the-art FleetCenter sports stadium, the Democratic National Convention will welcome some 5,000 delegates from 56 state and territorial delegations, a host of foreign dignitaries and honored guests, and 15,000 members of the domestic and foreign press. One wonders why it took so long to happen. After all, Boston is no shirker when it comes to American history. From the American Revolution to the abolition movement to the New Frontier, the city is renowned as a Cradle of Democracy. Think of the Boston Tea Party, the Boston Massacre of the first patriots who died for the cause of what became the American Revolution, the Battle of Bunker Hill, the Ride of Paul Revere, and the first telling victory in the Revolutionary War — the British Evacuation of Boston on March 17, 1776. On that seminal day, General George Washington chose a password that no British military strategist would ever surmise. It was “Saint Patrick.” And it was no accident that Washington did so. The majority of his troops were Irish immigrants. Boston was then, and is to this day, the most Irish city in the United States. Approximately 23 percent of the people who live in Massachusetts — more than twice the national figure — can claim Irish heritage. Many are descended from the 100,000 Irish immigrants who flocked to Boston during the mid-19th century Famine years when the potato crops across the length and breadth of Ireland were infected with blight and rotted on the vine. New York City may boast a greater number of Irish residents, but head-for-head Boston wins hands-down in the population percentage demographics. What, you may wonder, does this have to do with the 2004 Democratic National Convention? How about this: a Boston born and bred Irish-American chef named Kevin Doherty will be feeding over 30,000 DNC attendees. And the menu is not going to be the same old clichéd `meat and potatoes’ fare — not with Doherty at the helm. With roots that spring from County Donegal, one look is all it takes to deduce Doherty’s heritage. Stocky, with thick black hair and piercing blue eyes, he’s the epitome of Black Irish. His every stride implies purpose. He speaks with such rapier wit as would make even the most skilled shanachie smile. And when engaged in the tasks of his trade, his laserkeen concentration, deft skills, creativity, and superior artistry make every dish he prepares not only nutritious and palate pleasing, but visually stunning as well. I recently had occasion to witness Doherty in action. Delaware North Companies, owner and operator of Boston’s FleetCenter, and hospitality service agent for a myriad of national and state parks and other major sports stadiums across the nation, holds an annual Chefs’ Summit at the Culinary Institute of America in Napa, California which all of the corporation’s executive chefs attend for a week-long intensive series of workshops, seminars, and culinary competitions. This year’s corporate directive centered on adding organic, sustainable, high-protein, low-carb menu items to every operation in the system. In addition to their white kitchen garb and the tall toques that signify their rank, all the chefs had with them the tools of their trade: a set of razor-sharp knives. At the Culinary Institute with other chefs. A certified executive chef with the American Culinary Federation and a certified food safety professional with the National Environmental Health Association, Doherty has worked in the culinary industry for 25 years. During this time, he has served everyone from multitudes of Boston sports fans and dozens of internationally famous entertainers to royalty and heads of state, including the king and queen of Spain and the former President of Ireland Mary Robinson. 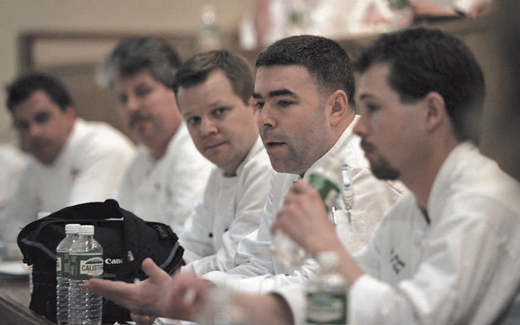 As executive chef at Boston’s FleetCenter, a Delaware North Companies-owned facility, Doherty has managed every aspect of FleetCenter foodservice since 2001, including all of the venue’s fine dining options offered through its luxury suites, inseat dining, and restaurants Banners, Legends, and The Premium Club. So, what does this culinary master think about feeding the Democratic Convention and the possible next President of the United States? “This is the most prestigious event the FleetCenter has ever hosted. The delegates will be here with a very serious purpose, but they want to enjoy themselves as well. I’ll be feeding the press too, and we all know what critics they can be,” he adds, with a touch of his trademark wit. When the Democratic presidential nomination is announced there’ll be fireworks, tons of confetti dumped on the crowd, thousands of balloons released into the air, and the Democratic nominees will lead their army of supporters and volunteers to a hoped-for victory in November. One thing’s certain: they’ll be marching on well-fed stomachs thanks to Chef Doherty. With a bit of Bostonian Irish luck, it might even mark the beginning of a political revolution. Sláinte! RECIPES: Two of Kevin Doherty’s recipes that will be served at the Democratic Convention. Fill medium pot 3/4 full of water and bring to boil. Add the lobster and cook until done — 10-12 minutes. Remove from water, cool in cold water, and remove meat from the shell. Discard shell. (Chop the lobster meat and reserve for later). Peel the potatoes and cut into 6 equal pieces, place in a pot of boiling water and cook until fork tender, about 15 minutes. While the potatoes are cooking melt 1/4 pound of butter and 1/2 pint of light cream in a pot and bring to boil. Remove and reserve for the potatoes. Next chop the green onions (scallions) into small 1/2 inch pieces including the top green part. When the potatoes are cooked, remove from water and place in a mixing or mashing bowl, add the lobster, scallions, and milk and butter mixture, as well as salt and pepper. Mash until smooth and hold hot for the salmon later. Remove the grapes from the bunch and place into a small bowl, add a little olive oil and salt and pepper, toss lightly, place on baking pan, roast 20 minutes. Be certain to save all liquid as well as the grapes; this is the garnish and the sauce. Place a small amount of oil in the sauté pan, over medium heat, let pan get hot, season salmon both sides with salt and pepper, when pan is good and hot, place salmon skin side up into the pan. Cook 5 minutes each side. Remove from pan, place on baking sheet and finish in the oven at 325°F for 8-10 minutes. Place a good scoop of the champ (mashed potatoes with lobster and green onion mix) in the center of the plate (heaping). Place the sautéed salmon filet on top of the champ. Spoon about 10-12 grapes and the juice over and around the salmon filet. Place a small piece of butter on the top of the fish to begin to melt as you serve this dish. Sprinkle a few chopped green onions as a garnish. Serves 5 people dinner. Total prep and cook time 40 minutes. Tooth pick for testing doneness. Take the 8 oz. butter (2 sticks) and cut into small pieces; place in stainless steel bowl, add the chocolate and place over double boiler; allow butter and chocolate to melt slowly, stirring occasionally. Take the remaining 1 oz. of butter and use it to grease the inside of the ramekin; add some flour to completely coat the butter (all sides and bottom). Place the 5 whole eggs and the 5 egg yolks in the other stainless steel bowl; add the sugar and whisk until pale in color and fluffy (this will take 7-8 minutes). Fold the egg/sugar mixture into the melted chocolate (stir them together gently) until completely mixed. Put about 10 griottines into each ramekin; divide the mix evenly into the six ramekins and place them in the baking pan; add water to the baking pan around the ramekins being sure not to overfill. Place the baking pan (water bath with the ramekins) in a preheated oven and cook at 350° F for 8-12 minutes depending on how runny you like the center. You can check the doneness by inserting a toothpick into the center and if it comes out wet, it is going to be runny. Place the cream in a cold stainless steel bowl and whip with wire whisk; zest or grate the orange peel; add to the cream and continue to whip until soft peaks form. Serving: Gateau may be served hot inside its ramekin. Serve topped with whipped cream.